Phineas Comadore “Dad” Harrier was born on March 5, 1878 in Vermillion County, Indiana, the third of four children born to Phillip Marion Harrier (1846-1881) and his wife, Rebecca Jane (Voorhees) Harrier (1854-1931). The Harrier family moved to Jackson County, Kansas in 1880 and Dad’s father passed away there in 1881. Dad’s mother was remarried in 1883 to James M. Thompson (1842-1884) and again in 1890 to Stephen J. Shay (1851-?). Dad learned the blacksmith trade and had moved to Netawaka, Kansas by 1900. The Harrier family’s next move was to Hiawatha, Kansas and then to Horton, Kansas before settling at Netawaka, Kansas in 1902. By 1911, Dad had purchased a Yale motorcycle and joined the Topeka Motorcycle Club. Dad was married to Effie Blanche (Cochren) (1876-1962) on July 5, 1915 at his mother’s home in Netawaka, Kansas and the couple left for a new machinist job in Nowata, Oklahoma in Dad’s racing car he called the Bluebird but they became stuck on a muddy road near Cherryvale, Kansas and they had to abandon the car there. Dad and Effie became the parents of three children: Ruth Elizabeth (Harrier) Cashman (1917-1996), Commodore Phillip “Bud” Harrier (1919-2003) and Orville Norvin Harrier (1923-2003). By 1918, the Harrier’s had moved from Nowata, Oklahoma to rural Topeka, Kansas where Dad was employed as an auto mechanic in a garage owned by J. R. Johnson. In October of 1919, Harrier took a job as a mechanic at the Hiawatha Buick Company in Hiawatha, Kansas so the family soon moved there with him. Late in September of 1922, Harrier used his foot on the crank of a Ford in an attempt to get it started. Instead, the engine kicked backward with the crank striking him on the leg and laying him up for more than 3 months. His injuries included broken bones in his foot and a paralyzed muscle below the knee in his leg which was the source of constant pain. In January of 1923, the Business Men’s Assurance company of Kansas City, Missouri paid Harrier’s claim of $400 as he had not been able to work in the Hiawatha Buick Company garage in Hiawatha since his accident the previous September. Dad Harrier was an inventor and quite an innovator with his race car. One of his innovations was an extra fin hinged at the tail of the car that folded flat with the tail. He could open it by means of some pulleys and a rope attached to his knee. The fin would act like the tail on an airplane and help keep the car out of a skid in the turns. Finish: Harrier finished 4th in the 5-car, 20-lap feature race behind Ed Lauer of Cherokee, Iowa; Eddie Reed of Orioles, Iowa in a Chevrolet #21 and Ray Hebert of Sioux City, Iowa who was driving the “Oh See special”. Feature race winner: Ed Lauer of Cherokee, Iowa who was driving an Emden automobile that had placed 11th in the 1915 Indianapolis “500”. Finish: Harrier finished 2nd in the 4-car, 5-mile, 1st heat race behind Wilbur D. Mercer of Bartlesville, Oklahoma who was driving his own Dewey Kid special. Harrier finished 3rd in the 4-car, 5-mile 2nd heat race behind Wilbur D. Mercer of Bartlesville, Oklahoma who was driving his own Dewey Kid special and _____ Mayfield in his own Ford. 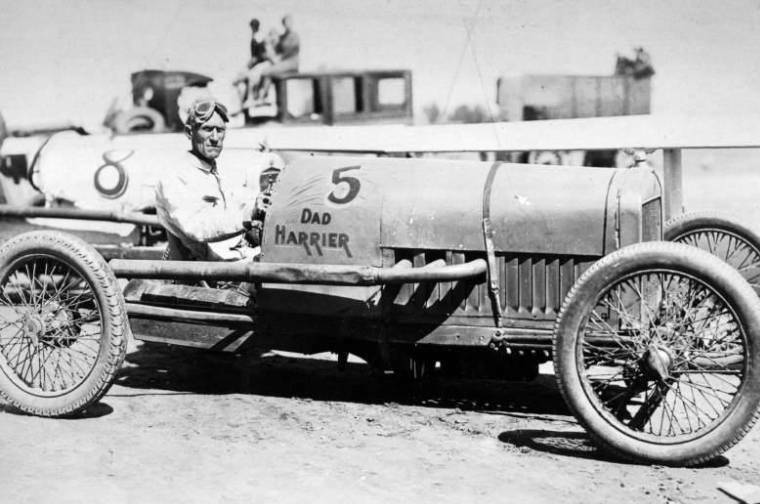 Harrier finished 2nd in the 4-car, 5-mile, 3rd heat race behind Wilbur D. Mercer of Bartlesville, Oklahoma who was driving his own Dewey Kid special. Feature race winner: Wilbur D. Mercer of Bartlesville, Oklahoma who was driving his own Dewey Kid special. Finish: All that is known of these races so far is the name of the feature race winner. Finish: It was reported in the Brown County World newspaper that Harrier “cleaned” up in these races although the specific race results were not given. They did report that his winnings totaled $190. Feature race winner: Phineas Comadore “Dad” Harrier of Topeka, Kansas. Finish: Harrier’s name does not appear in the published results of these races. Feature race winner: Frank Howard who was driving a Chevrolet. Car: Harrier’s own white 1913 Fronty Ford special #6 referred to as the Topeka special in prerace advertising. Finish: Harrier’s Topeka special “jumped the track in an early heat race, crashed into the fence at 40 m.p.h. taking out 7 new hedge posts and Harrier was scratched up some.” Since only 4 cars entered these races, the crowd had to wait through a half-hour delay but repairs were made and the races continued with Harrier in the competition. Finish: Harrier had the 4th fastest 2-lap time trial of 1:25.6 which was slower than the time trials run by Ed Lusk of Dewey, Oklahoma in a Ford known as “The Oklahoma Kid”; Lieut. Perry McWhorter of Bartlesville, Oklahoma driving a Peugeot and Roy Mudget of Joplin, Missouri who was driving a Hudson. Harrier did not finish the 4-car Australian Pursuit due to mechanical trouble. That race was won by Ed Lusk of Dewey, Oklahoma in “The Oklahoma Kid” Ford followed by Lieut. Perry McWhorter of Bartlesville, Oklahoma who was driving a Peugeot. Roy Mudget of Joplin, Missouri also dropped out of this race with a burned-out bearing in his Hudson. Harrier won a 2-mile match race with Ed Lusk of Dewey, Oklahoma in “The Oklahoma Kid” Ford in 2:50.4. Harrier finished 2nd in a 2-mile match race with Lieut. Perry McWhorter of Bartlesville, Oklahoma in a Peugeot in 3:02.4. Harrier finished 2nd in the 2-car, 5-mile, Free-for-All race behind Lieut. Perry McWhorter of Bartlesville, Oklahoma in a Peugeot. Feature race winner: Lieut. Perry McWhorter of Bartlesville, Oklahoma who was driving a Peugeot. Finish: Harrier ran the 5th fastest 2-lap time trial of 1:20.0. That was only slower than the times turned in by Larry Stone of Tulsa, Oklahoma who was driving a Duesenberg #8; Jimmie Costa of Anthony, Kansas who was driving a Fiat #28; an unidentified driver of an Essex and R. Ray Rountree of Portland, Oregon who was driving a Rajo Ford. Harrier won the 1st 6-lap heat race in 4:07.0 for which he collected $240 from the purse. R. Ray Rountree of Portland, Oregon finished in 2nd place in a Ford. Harrier got off to a poor start and then dropped out of the 20-lap Liberty sweepstakes “Free for All” race one lap later contending that the racetrack was too dusty to continue safely. The race was won by Jimmie Costa of Anthony, Kansas followed by Earnie Fosnaugh of Indianapolis Indiana in a Severen special #34; R. Ray Rountree of Portland, Oregon in a Rajo Ford and Larry Stone of Tulsa, Oklahoma in a Duesenberg #8. Feature race winner: Jimmie Costa of Anthony, Kansas in a Fiat #28. Finish: Harrier finished 3rd in the feature race behind Lew Reynolds of St. Joseph, Missouri who was driving a Studebaker, and a Dodge, the driver of which has yet to be learned. 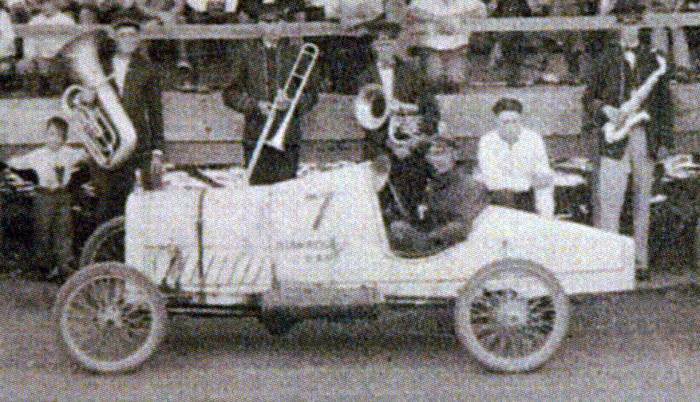 Finish: Harrier finished 4th in the 3-mile race behind _____ Rotter of Salina, Kansas who was driving a Ford; Albert “Al” Koepke of Topeka, Kansas in his own Ford Frontenac #8 and George McClelland of St. Joseph, Missouri in a Dodge special. Rotter won even though his Ford suffered a broken axle during this race. Harrier finished 5th in the 10-mile race behind _____ Rotter of Salina, Kansas who was driving a Ford; Albert “Al” Koepke of Topeka, Kansas in his own Ford Frontenac #8; Lew Reynolds of St. Joseph, Missouri who was driving a Studebaker and George McClelland of St. Joseph, Missouri who was driving a Dodge special. Feature race winner: _____ Rotter of Salina, Kansas who was driving a Ford. Finish: These races were postponed until September 29, 1920 as the racetrack was too soft to use due to recent rains. Finish: 2nd in the 2-lap time trials running 2-laps in 1:20..0 which was only slower than the time trial run by the unidentified driver of an aluminum Ford special. 2nd in the 1st 3-car, 5-mile race behind Willis Young in his own Hudson “Super Six”. 2nd in the 3-car, 5-mile feature race behind the unidentified driver of an aluminum Ford special. Feature race winner: The unidentified driver of an aluminum Ford special. Feature race winner: Johnny Mais of Salina, Kansas in his own Dodge. Feature race winner: W. W. Brown of Kansas City, Missouri who was driving a Peerless 8. Finish: Harrier’s Fronty Ford special broke an axle and ost a wheel causing him to coast to a stop near the woven wire fence around the racetrack in the 10-mile “Free for All” race that was won by Johnny Mais of Salina, Kansas. Finish: Harrier finished 3rd in the 9-car, 10-mile feature race to win $75 from the purse. Feature race winner: Phineas Comadore “Dad” Harrier of Topeka, Kansas. His total winnings for these two races was $175. Finish: Harrier finished 3rd in a heat race. Harrier finished 2nd in the feature. Finish: Harrier ran the 15th fastest lap in a field of 16 cars, in time trials with 1 lap of 65.0 seconds. That was only slower than the laps run by Harley Wells of St. Joseph, Missouri in Lexington special; Noel Bullock of North Platte, Nebraska in a Rajo Ford; Jack McCarver of Salina, Kansas in Dodge special; Tom Garrett of Bertrand, Nebraska in a Ford special; Earl Garrett of Franklin in a Ford special; Lew Reynolds of St. Joseph, Missouri in a Durant special; _____ Bolus of Halliam, Nebraska in a Ford special; _____ Hawkins of North Platte, Nebraska in a Ford special; A. Prextaver of North Platte, Nebraska in a Dodge special; William Grimm of North Platte, Nebraska in a Hudson; Earl Foster of Holdridge, Nebraska in a Dodge special; Harold Furlong of Kirwin, Kansas in a Chevrolet special; Kemit Shery of St. Joseph, Missouri in a Durant special and E. S. Jones of St. Joseph, Missouri in a Peerless. 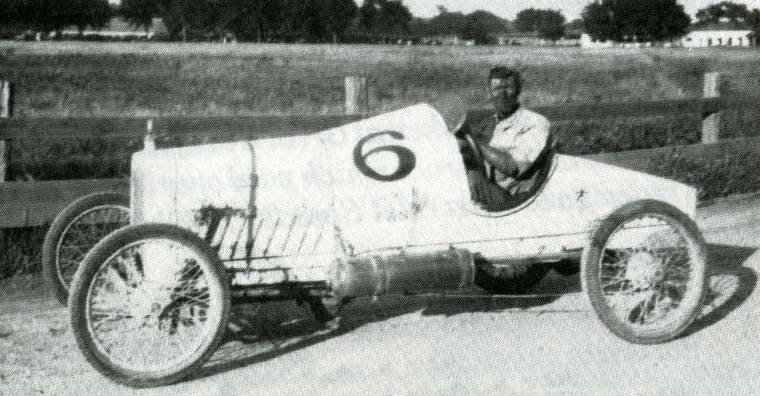 The only driver to run a slower in time trial than Harrier, was Ira Headley of Broken Bow, Nebraska who was driving the Harding special owned by George H. “Pop” Harding of Doniphan, Nebraska. 3rd in the 10-mile “Class B” race behind Earl Foster of Holdridge, Nebraska in a Dodge special and Harold Furlong of Kirwin, Kansas in a Chevrolet special. Finish: Harrier lost a novelty race against Glenn Neibling who was a star runner for the Hiawatha High School track team. Harrier was to run four laps in his 1913 Fronty Ford special #6 before Neibling could run one lap of the ½ mile dirt racetrack but Neibling completed his one lap before Harrier completed four. Harrier finished 4th in the 3-mile Free-for-All race behind Albert “Al” Koepke of Topeka, Kansas; John Gerber of Meridian, Kansa who was driving a 490 Chevrolet special and _____ Briech of Kansas City, Missouri. Harrier finished 2nd in the 5-mile Free-for-All race behind Albert “Al” Koepke of Topeka, Kansas. Feature race winner: Albert “Al” Koepke of Topeka, Kansas in his own Ford Frontenac #8. Finish: Harrier ran the fastest 2-lap time trial and set a new track record in the process. Harrier finished in 3rd place in the 10-mile feature race but nothing more has been learned about these races. Finish: Harrier finished in 2nd place in the Class B race behind Furlong Clark who was driving a car owned by _____ Kinney. Feature race winner: King Rhiley of Oshkosh, Nebraska who was driving a Hudson “Super-Six”. Feature race winner: Walter Higley of Longmont, Colorado who was driving a Rajo Ford. Finish: Harrier’s name was published on a list of race winners on this day but nothing more is known about his performance. Feature race winner: Leonard Kerbs of Otis, Kansas who was driving his own Kerbs special Ford. Finish: Harrier finished 3rd in a 10-mile race behind J. K. McFadden of Walsenburg, Colorado in a Ford special and Ralph Furlong of Agra, Kansas. Finish: Harrier won the 5th heat race in 5:59.0. E. J. Voboril finished this race in 2nd place. Finish: Harrier won the 5th heat race in 5:55.0. E. J. Voboril finished this race in 2nd place. Finish: Harrier drove his Fronty Ford special for four laps of the racetrack in a novelty race while Glenn Nibling of Hiawatha, Kansas; Charles Rumold and John Shannon of Holton, Kansas all ran one lap on foot. Nibling completed the distance 1st followed by Rumold in 2nd place. Harrier finished 3rd and John Shannon dropped out and did not complete the race. Harrier won the 1st two heats of the Sweepstakes race. Bob Tyner finished in 2nd place in a Rajo Ford special and Edwin Rochel finished 3rd in a Dodge. Finish: Harrier finished 3rd winning $25 in the 5-mile Class “A” race behind Harley Wells of St. Joseph, Missouri who was driving a Durant and Rex Edmonds of Houston, Texas who was driving a Ford. Finish: Harrier entered these races but became one of two drivers who got stuck on muddy roads in route and were not able to arrive. Car: Harrier’s own white 1913 Fronty Ford special #7. Note that Harrier had to change his car number for these races as the Poole special #6 was entered as well. Car: Harrier’s own white 1913 Fronty Ford special #7. Feature race winner: Phineas Comador “Dad” Harrier of Hiawatha, Kansas who was driving his Fronty Ford special #6. Finish: These races were postponed until October 10-11, 1927 due to rain. Finish: Harrier’s name does not appear in the limited results of these races that have been located to date. Feature race winner: Hampton L. Cox of St. Joseph, Missouri who was driving a LaMont special owned by Eddie LaMont. Finish: Harrier ran the 16th fastest lap in time trials of 33.9 seconds. That was slower than the laps run in time trials by Billy Arnold of Chicago in a 16-valve Fronty Ford (30.0); John Gerber of Topeka, Kansas in his own 490 Chevrolet special #15 (30.2); Gus Schrader of Cedar Rapids, Iowa in a Dodge (30.2); Leslie “Les” Allen of Chicago in a Frontenac (30.2); Duane Dike “D. 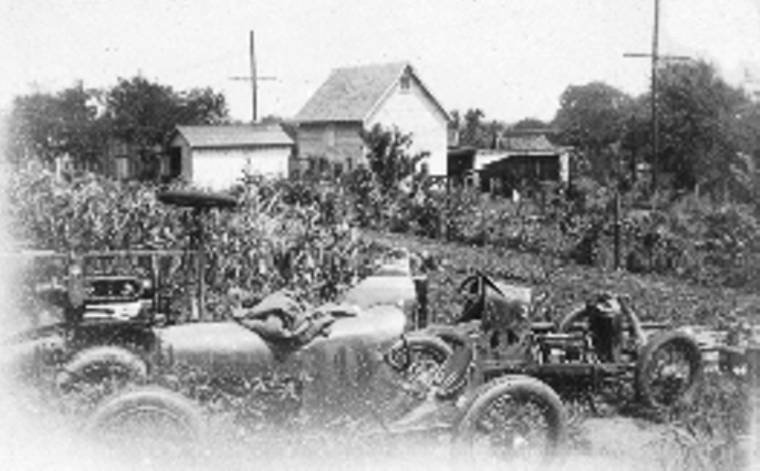 D.” Morris of Chicago in the Woodbury Frontenac (30.4); Bert Ficken of Sioux City, Iowa in a Dodge (30.7); Frank Schenk of Keokuk, Iowa in a Chevrolet (31.2); Ralph Eckstrom of Chicago in a Fronty Ford (31.3); Albert “Al” Koepke of Topeka, Kansas in a Fronty Ford (31.5); V. W. Peterson of Sioux Falls, South Dakota in a Dodge (31.6); M. J. Miller of Cedar Rapids, Iowa in a double ignition Fronty Ford (31.6); Harley Wells of St. Joseph, Missouri in a Fronty Ford (31.8); Sam Hoffman of Sioux City, Iowa in a Fronty Ford (32.0); Glen Hiett of Rock Island, Illinois in a Saxon-Duplex (32.3) and Floyd Bobzien of Marengo, Iowa in a Dual Overhead Fronty (32.7). The feature race was shortened due to rain. Feature race winner: Leslie “Les” Allen of Chicago, Illinois in his own Frontenac. Finish: Harrier finished 3rd in the 25-mile feature race behind James E. “Jim” White of Lost Springs, Kansas and Jack Green who was driving a Kerbs special Ford owned by Leonard Kerbs of Otis, Kansas. Feature race winner: James E. “Jim” White of Lost Springs, Kansas who was driving a Ford he owned himself. Finish: Harrier won the 5-mile Class “B” race in 5:43.0. Charles “Buck” Carroll of Scammon, Kansas finished in 2nd place. Harrier won the Australian Pursuit over John Gerber of Topeka, Kansas who was driving his own 490 Chevrolet special #15. Feature race winner: John Gerber of Topeka, Kansas who was driving his own 490 Chevrolet special #15. Finish: Harrier’s name does not appear in the limited results of these races that have been located to date but we do know that Albert “Al” Koepke of Topeka, Kansas and Dad Harrier worked late into the evening under a shade tree fitting a Hudson carburetor onto a Ford Frontenac intake manifold for Harrier’s new Fronty Ford engine. Finish: All that is currently known about these races is that Harrier set a new track record. Finish: Harrier finished 2nd in the 18-lap feature race behind Bill McMahon of Los Angeles, California. Finish: Harrier’s name does not appear in the limited results of these races that have been located to date but his windshield was broken by small dirt clods during the race and he decided that this was the last time he would race on a speedway this big and fast. Finish: Harrier finished 4th in the 2nd heat race. Harrier finished 4th in the 5-lap consolation race behind J. D. Connitzer who was driving a Fronty Ford; Albert “Al” Koepke of Topeka, Kansas who was driving his own Fronty Ford and James D. “Dusty” Deines of Topeka, Kansas who was driving his own Deines special. Feature race winner: John Gerber of Topeka, Kansas who was driving his own 490 Chevrolet special #15 that he called a Whippet special. Finish: Harrier finished 3rd in the 4-car, 5-lap 1st “Class B” heat race behind Albert “Al” Koepke of Topeka, Kansas who was driving his own Ford Frontenac and Dusty Deines of Topeka, Kansas in his own Deines special. 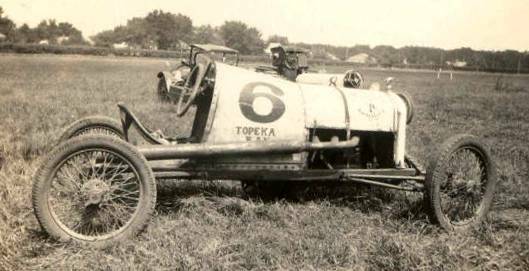 Harrier finished 2nd in the 4-car, 10-lap 2nd “Class B” heat race behind Albert “Al” Koepke of Topeka, Kansas who was driving his own Ford Frontenac. Harrier fell behind at the start and steadily fell farther behind until he withdrew from the 4-car, 20-lap “Free-for-All” race, finishing behind John Gerber of Topeka, Kansas who was driving a Chevrolet #15 that he called a Whippet special; Albert “Mike” Koenitzer of Meriden, Kansas who was driving a Chevrolet special and Albert “Al” Koepke of Topeka, Kansas who was driving his own Ford Frontenac. Finish: These races were postponed until October 1, 1927 due to rain. Finish: Harrier finished in 2nd place in the 1st heat race behind John Gerber of Topeka, Kansas. Harrier finished in 2nd place in the feature race behind John Gerber of Topeka, Kansas. Finish: Harrier won the 6-car, 8-lap consolation race in 4:46.0. Forest “Blackie” O’Bannon, a.k.a. R. F. Dutton, of Arkansas City, Kansas finished in 2nd place in his Hutch special #45. Harrier finished in 5th place on the lead lap in the 12-lap “Grand Final” race behind James Floyd “J.F.” Pickens of Arkansas City, Kansas; Marvin Wesley “Mack” McAnally of Winfield, Kansas in the Superior Special Hisso #1434; Alfred Lloyd “Ducky” Scott* of Topeka, Kansas in the Front-Wheel-Drive #571 and Forest “Blackie” O’Bannon, a.k.a. R. F. Dutton, of Arkansas City, Kansas in his Hutch special #45. Feature race winner: James Floyd “J.F.” Pickens of Arkansas City, Kansas who was driving the #440 Ford special owned by Joe Hutchinson of Arkansas City, Kansas. Finish: Harrier won the 2nd 7-car, 10-mile heat race in 9:23.8. The 2nd place finisher was Albert “Al” Koepke of Topeka, Kansas. Harrier finished 3rd in the 1st 5-car, 5-mile heat race in behind Albert “Al” Koepke of Topeka, Kansas and C. E. Timmins of Shawnee, Oklahoma. Harrier finished 3rd in the 50-mile feature race behind Ray Munsell of Vancouver, British Columbia, Canada and C. E. Timmins of Shawnee, Oklahoma. Finish: Harrier finished 3rd in the 10-mile Straw Hat Derby behind Rex Edmonds of Houston, Texas in his Chevrolet special and Rea Bray of Hutchinson, Kansas in his Fronty Ford special. Harrier finished 2nd in the 50-mile feature race behind Albert “Al” Koepke of Topeka, Kansas. Finish: Harrier finished 3rd in the 5-mile race behind John Bagley of Omaha, Nebraska and Lawrence O. ”Hughie” Hughes of Beatrice, Nebraska. Harrier finished 3rd in the 10-mile feature race behind John Bagley of Omaha, Nebraska and Lou Fenno of Rock Island, Illinois. Finish: Harrier finished 3rd in the 5-mile consolation race behind Jack Baker of Jefferson, Iowa who was driving a Rajo Ford and Albert “Al” Koepke of Topeka, Kansas who was driving a Chevrolet. Finish: Harrier finished 3rd in the 1st 7-lap heat race behind Swan Peterson of Galesburg, Illinois who was driving his own Fronty Ford #11 and Albert “Al” Koepke of Topeka, Kansas who was driving a Frontenac special #8. Feature race winner: Swan Peterson of Galesburg, Illinois who was driving his own Fronty Ford #11. Finish: Harrier finished 2nd in the 4-car, 10-lap Class “B” heat race behind Jim White of Sharon Springs, Kansas who was driving his own White Special Frontenac #28. Harrier finished 3rd in the 4-car, 6-lap “Kansas Championship Dash” behind Pat Cunningham of St. Joseph, Missouri in a Frontenac #7-11 owned by Roy O’Laughlin of Hutchinson, Kansas and Albert “Al” Koepke of Topeka, Kansas who was driving a Frontenac special #8. Feature race winner: Rex Edmonds of Houston, Texas in a Chevrolet special #77 owned by Harold Edward “Red” Grange. Finish: Harrier finished 3rd in the 4-car, 6-lap “Kansas Championship Dash” behind Albert “Al” Koepke of Topeka, Kansas who was driving a Frontenac special #8 and Pat Cunningham of St. Joseph, Missouri in a Frontenac #7-11 owned by Roy O’Laughlin of Hutchinson, Kansas. Barney Oman of Lon Angeles, California led the 1st 5-laps of the Straw Hat Derby in his Miller #101 only to lose his hat on the final straightaway. Harrier assumed the lead at that point and won the 6-car, 6-lap race in 3:49.2, collecting $75 from the purse for his efforts. 2nd place went to Jim White of Sharon Springs, Kansas who was driving White Special Frontenac #28 and he collected $25 from the purse for that finish. Feature race winner: Jim White of Sharon Springs, Kansas who was driving his own White Special Frontenac #28. Finish: Harrier tied with Tom Holden of WaKeeney, Kansas for 5th place in time trials with a lap of 48.0 seconds. That lap was only slower than the laps run by Vic Felt of Deer Trail, Colorado; Leonard Kerbs of Otis, Kansas; Willard Prentiss of Denver, Colorado and Jim White of Sharon Springs, Kansas. Harrier finished in 4th place in the 7-car, 15-mile race behind Vic Felt of Deer Trail, Colorado; Leonard Kerbs of Otis, Kansas and Willard Prentiss of Denver, Colorado. Finish: Harrier won the 8-mile race followed by Clarence “Speed” Haskell of Lincoln, Nebraska. Harrier won the 5-mile race followed by Harold “Red” Kinser of Lyndon, Kansas who was driving a Laurel Ford special #51. Harrier won the 10-mile race followed by Harold “Red” Kinser of Lyndon, Kansas who was driving a Laurel Ford special #51. Harrier and Clarence “Speed” Haskell of Lincoln, Nebraska finished in a tie in the Feature race. Finish: Harrier ran the 7th quickest lap in time trials of the 15 cars entered to take time trials. His lap of 35.0 was only slower than the laps run by Louis J. “Speed” Irwin of Iola, Kansas who was driving a Fronty Ford; Art Hutchin of Tulsa, Oklahoma who was driving a Laurel special; Harold “Red” Kinser of Lyndon, Kansas who was driving a Laurel Ford special #51; Fred Littleton of Kansas City, Missouri who was driving a the D & L Fronty Ford special #7; Larry Steele of Glendale, California who was driving a Fronty Ford and Slim Ellison of Ascot Park, California who was driving a car known only as the “Mystery X” car. Harrier finished 3rd in the 4-car, 8-lap 2nd heat race behind Louis J. “Speed” Irwin of Iola, Kansas who was driving a Fronty Ford and Larry Steele of Glendale, California who was driving a Fronty Ford. Harrier won the 5-car, 6-lap straw hat derby in 3:41.1. 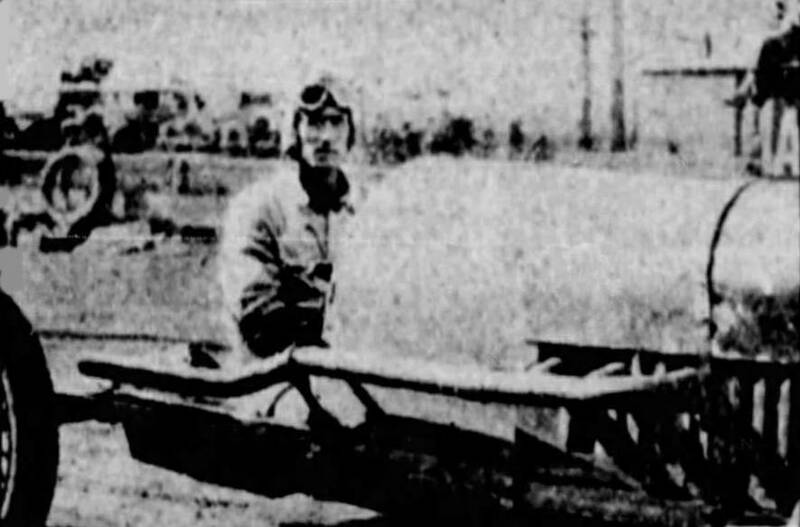 J. Chester White of Oklahoma placed 2nd in this race in a front-wheel-drive car. Harrier finished 2nd in the 8-car, 15-lap sweepstakes race behind Art Hutchin of Tulsa, Oklahoma #101. Feature race winner: Art Hutchin of Tulsa, Oklahoma who was driving an overhead cam Laurel Ford special #101. Finish: Harrier got lost in the dust and took out 30-feet of the fencing around the racetrack. He also broke most of his ribs in the accident. Finish: Harrier ran the 3rd fastest lap in time trials of 34.0 which was only slower than the laps run by Art Hutchin of McAlester, Oklahoma and Larry Steele of Kansas City, Missouri who was driving a Fronty Ford #77. Harrier finished 2nd in the 5-car, 8-lap preliminary race behind Art Hutchin of McAlester, Oklahoma who was driving a blue Whippet #101. Harrier won 3-car, 4-lap Three-corner race in 2:17.0. Fred Littleton of Kansas City, Missouri, driving the D & L special #7, finished in 2nd place. Harrier passed 3 cars on the final lap of the feature race to finish in 2nd place behind Art Hutchin of McAlester, Oklahoma in the 7-lap, 8-car race that was shortened due to a threat of rain. Feature race winner: Art Hutchin of McAlester, Oklahoma who was driving a blue Whippet special #101. Finish: Harrier competed in the 10-lap consolation race but nothing else has been learned about these races to date. Finish: Harrier won a 4-lap race and placed 2nd in another race but nothing more has been learned about these races. Finish: Harrier ran the 5th fastest time in time trials running one lap in 30.3 seconds. That was only slower than the laps run by Pat Cunningham of St. Joseph Missouri in the B&B special supercharged Ford Frontenac #700; Lawrence O. “Hughie” Hughes of Beatrice, Nebraska in the #101 Hughes special; _____ Ojers in the Ojers & Robare special and W. D. Lyons in the Lyons special. Harrier placed 2nd in the 10-lap Class B heat race behind Lawrence O. “Hughie” Hughes of Beatrice, Nebraska. Harrier collected $40 form the purse for that 2nd place finish. Finish: Harrier’s name does not appear in the published results of these races but we know that he was racing at the North Central Kansas Fairgrounds at Belleville, Kansas on August 29, 1929. Feature race winner: Jim White of Sharon Springs, Kansas in his own White special Ford Frontenac #28. Finish: Although Harrier entered these races, it is obvious that he could not have competed in them as he was racing at Carthage, Missouri. Finish: Harrier ran the 3rd fastest lap in time trials of 34.0 which was only slower than the laps run by Art Hutchin of McAlester, Oklahoma and Larry Steele of Kansas City, Missouri who was driving a Fronty Ford. Harrier finished 2nd in a 5-car, 8-lap preliminary race behind Art Hutchin of McAlester, Oklahoma. Harrier passed 3 cars on the final lap of the feature race to finish in 2nd place behind Art Hutchin of McAlester, Oklahoma in the 7-lap event that was shortened due to a threat of rain. Finish: Harrier won the 5-mile Class A race followed by Clarence “Speed” Haskell of Lincoln, Nebraska. Harrier won the 10-mile Class A race in 11:00.0. He was followed by Speck Heminger of Lincoln, Nebraska in 2nd place. Feature race winner: Phineas Comador “Dad” Harrier of Topeka, Kansas. Finish: Harrier ran the second fastest lap in time trials of 34.0 which was only slower than the lap run by Fred Littleton of Kansas City, Missouri who was driving the D & L special #7. Harrier won the 1st 6-lap heat race finishing ahead of Hobart Tucker of Elkhart, Kansas who was driving a Chevrolet. Harrier won the 5-car, straw-hat derby that was scheduled for 10-laps but it only lasted for 3 laps before Harrier was flagged the winner. Harrier won the 6-car, 10-lap sweepstakes race from his pole starting position. Happy Fox of Kansas City, Missouri finished in 2nd place. Finish: Harrier ran the 4th fastest lap of 33.8 seconds in time trials which was only slower than the laps turned in by Tullio M. “Toots” Campo of Kansas City, Missouri who was driving a Deauchenan (or Deschano) #38-2 powered by a Frontenac engine; Fred Littleton of Kansas City, Missouri in the D & L special #7 and Larry Steele of Tulsa, Oklahoma who was driving a Laurel Ford. Harrier finished 3rd in the 3-car, 5-lap 2nd heat race behind Major Cline of Knoxville, Tennessee in a Chevrolet and Happy Fox of St. Louis, Missouri who was driving a Davis special #77. Harrier won the 5-car, 8-lap 3rd heat race in 4:47.8. Happy Fox of St. Louis, Missouri finished in 2nd place in the Davis special #77. Harrier won the 8-car, 10-lap sweepstakes race in 6:05.8 despite losing a wheel on the 7th lap of the race. Phil Cline of Knoxville, Tennessee, who was driving a Laurel Ford, finished in 2nd place. Feature race winner: Phineas Comador “Dad” Harrier of Topeka, Kansas who was driving a Frontenac #52. Feature race winner: Vern McComb of North Chicago, Illinois who was driving the Palmer special #500. Finish: Harrier ran the 4th fastest lap of 33.5 seconds in time trials. Harrier finished 4th in the 1st heat race. Harrier finished 6th in the 2nd heat race. Feature race winner: Lew Irwin of Iola, Kansas who was driving the Lawhon special #X3 which was owned by George Lawhon of St. Joseph, Missouri. Finish: These races were postponed until September 26, 1931 due to rain. Finish: Harrier finished 2nd in the 2nd 5-mile heat race behind Phil Cline of Knoxville, Tennessee. Harrier finished 2nd in the 3rd 5-mile heat race behind Phil Cline of Knoxville, Tennessee. Finish: Harrier placed in 2nd place in the feature race but no other results of these races have been located to date. Finish: Harrier was leading the “Free-for-All” race on the 4th lap. He had just exited the west turn and headed down the front straightaway in front of the grandstand when his left front wheel struck a tow-car belonging to Phil Cline of Jefferson City, Tennessee which had been left at the inside of that front straightaway. Harrier’s Fronty swerved and then executed a 360-degree spin. He was thrown from the car and landed on his head 15 to 20 feet in front of the car. X-rays showed no fractures but he was in and out of consciousnesses the day following the accident. Later test revealed that he had suffered a brain concussion and numerous bruises. Harrier’s injuries in this accident ended his racing career. Finish: Harrier had pre-entered these races but was hospitalized with serious injuries suffered in an accident on October 6, 1931 while leading the “Free-for-All” race at Anthony Downs at Anthony, Kansas so “Dad” Harrier was unable to compete in these races. Dad Harrier was known to be an honest man and fair in all of his dealings with his competitors. He was a conservative race driver who was seldom involved in accidents. He was also a master mechanic and a sought-after traveling companion by his competitors, although he would not put up with any foolishness. His hair had turned prematurely white which he was sensitive about until he learned to embrace it. He was given the nickname “Dad” (or occasionally “Pop”), as a way the racing community acknowledged that he was thought of as the oldest driver racing on the midwestern auto racing circuit. He probably was the oldest although he was not as old as most others thought he was. The injuries Harrier suffered in the accident at Anthony, Kansas on October 6, 1931 necessitated his retirement from the sport. 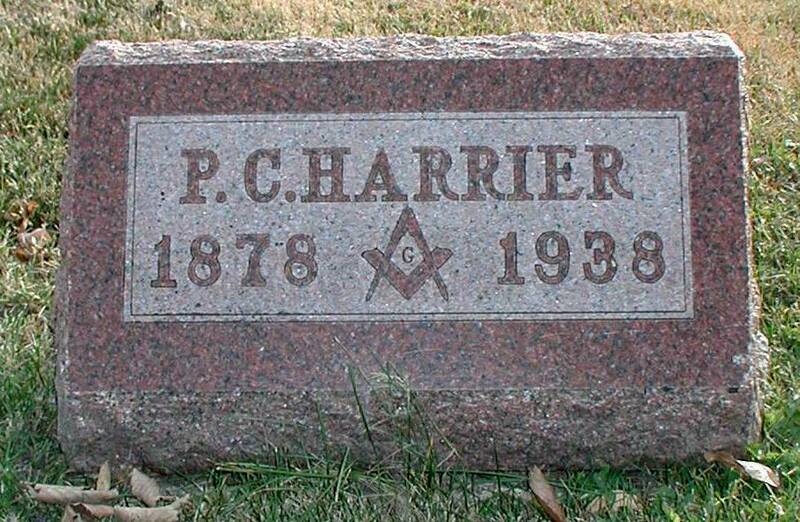 He eventually succumbed due to complications from those injuries on December 1, 1938 at his home at Netawaka, Kansas and he is buried in the Netawaka Cemetery at Netawaka. "Dad" Harrier in his 1913 Ford Frontenac during prerace ceremonies on the racetrack before the start of the races at Hobart, Oklahoma on either September 11, 1925 or September 12, 1925. Note that Harrier changed his car number from its usual #6 for these races as the Poole special #6 was also entered. "Dad" Harrier of Hiawatha, Kansas in his 1913 Ford Frontenac right after a race in 1926. This is one of "Dad" Harrier’s earlier cars. Note the #8 car in the background as well. This is a publicity photo taken of “Dad” Harrier in one of his Fronty Ford race cars. "Dad" Harrier’s personal racing salvage yard behind his home on United States rural mail route #27 at Topeka, Kansas in 1930. "Dad" Harrier in his #52 bobtail at Carthage, Missouri on August 8, 1930. He won a race that day while finishing on only three wheels. Note that the car number was also his real age at the time although press reports of the day incorrectly gave his age as being 67. Netawaka Cemetery on the west edge of Netawaka, Kansas. * Alfred Lloyd “Ducky” Scott (1905-1988) promoted several auto races in Kansas before going east to promote auto thrill shows with his “Congress of Daredevils” a.k.a. “American Daredevils” in the eastern states. ** Note that Harrier was entered in races at more than one racetrack on this date, although he most likely did not compete in all of them.